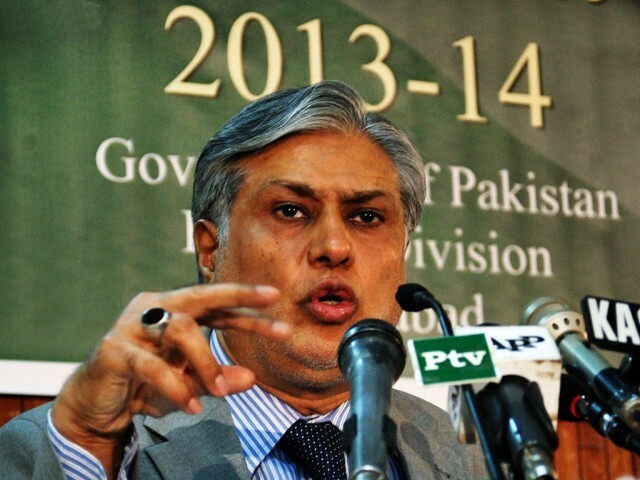 Dar, howeve­r, pledge­s to increa­se growth rate by 1% every year taking it to 7% by 2017. A synopsis of the government’s economic performance in its first year in power sharply contrasted with Finance Minister Ishaq Dar’s claims that the economy was on a path of revival as almost all key economic targets fell short — highlighting the consequences of delays in introducing tough structural reforms. Though the gross domestic product (GDP) rate crawled up to 4.1% for the first time in the last six years, it fell short of the targeted rate of 4.4% for the fiscal year 2013-14. The country’s per capita income grew at a dismal 1.4% to $1,386 per person. “We have missed the targets but we still achieved 75% to 80% of our goals against each target,” said the finance minister as he unveiled the Economic Survey of Pakistan for the fiscal year 2013-14. Still, he pledged that the government would try to increase the growth rate by 1% every year taking it to 7% by 2017. 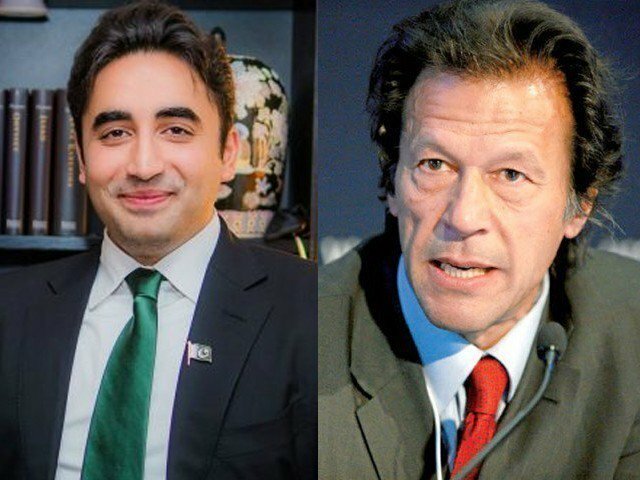 Interestingly, the confidence exuded by the finance minister last year over his economic revival plans following a dismal performance by the Pakistan Peoples Party government, did not translate into achieving targets that he had set for himself for the outgoing fiscal year. The Economic Survey of Pakistan showed that the key indicator — the tax-to-GDP ratio — which has brought immense shame for the country due to a dismal performance, was again missed and stood at only 8.8%. The Pakistan Muslim League-Nawaz (PML-N) government had promised to increase the ratio to 9.5% during the outgoing fiscal year. Similarly, the tax collection target was missed by a wide margin of Rs200 billion and the expected collection is now Rs2.275 trillion. The government also missed the target of economic growth, investment and savings, the three core measures that depict the real health of the economy. The performance in investment, savings and sub-sectors of agriculture and services was even worse than that witnessed during the five year PPP government. Commenting on missed targets, the finance minister said his government had set stretched targets in the first place to make sure all stakeholders give their 100% to improve the economy. “In one year economic reforms cannot be completed and the economy cannot be revived within one year,” admitted Dar while responding to a question on his government’s inability to perform against their own declared indicators. The investment to GDP ratio remained at 14% against a target of 15.1%. The ratio was below last year’s rate of 14.6%. Savings slipped to 12.9% against the target of 14%. Last year, the savings-to-GDP ratio was 13.5%. Dar claimed that the first year was consumed in firefighting to help stabilise the economy. Despite the grim projection, he said real work on economic reforms will begin from the next fiscal year. Our efforts were focused to foil bids of those who wanted to see Pakistan a failed economic state, he added. “Fiscal dominance over financing needs crowded out private sector investment,” according to the planning commission’s assessment. It added that a peculiar security situation and structural rigidities surrounding governance and regulatory environment led to missing investment targets. But the government did manage to achieve this fiscal year’s budget deficit target of 5.8% of the GDP. Dar said the budget deficit in the next fiscal year will be brought down further by 1% of the GDP. Against a target of 4.4%, the economy grew 4.1% in the current fiscal year. According to the finance minister, estimated economic losses due to load-shedding were 1.5% to 1.75%. He added that government recouped half of these losses in this fiscal year. 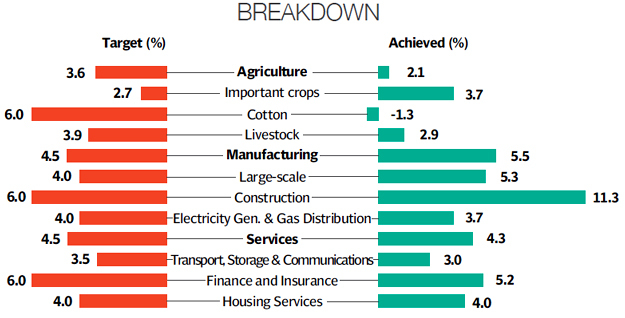 Except for industry, targets set for main sectors of the economy were also missed. 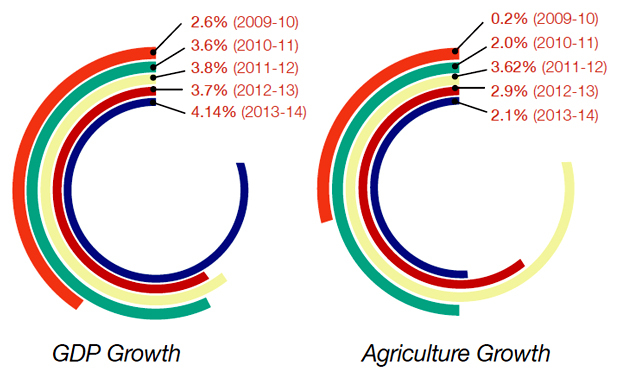 The agriculture sector grew at 2.1%, far below the 3.8% target and last year’s growth rate of 2.9%. The industrial sector grew 5.8% against the target of 4.8%. 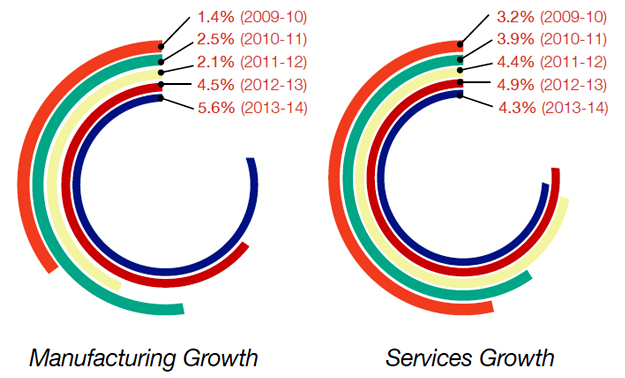 The services sector grew 4.3%, which is below the target of 4.5% and even last year’s growth rate of 4.9%. Dar said reduction in general services due to spending cuts led to missing the target in the services sector. The government also missed its target for containing inflation at 8% that accelerated to 8.6% in the first ten months of the fiscal year. Dar said the IMF was of the view that inflation would run into double-digits but we have managed to restrict it to around 8.6%, despite increase in electricity tarriffs. In order to show a growth of 4.3% in exports, the federal government took shipment figures. On the basis of proceeds, growth in exports was over 2%. Dar said the current account deficit –measures by how much outflows exceed inflows – during first ten months remained at $2.2 billion. Dar said foreign investments during first ten months of the fiscal year remained at $2.8 billion including $2 billion raised by floating Euro bonds. Until May 10, Dar said, the government’s borrowings had been reduced to Rs199.6 billion as against Rs992.9 billion of the comparative period. Instead of adding new debt, the government retired Rs10 billion of SBP borrowings. The survey showed that the overall education situation slightly improved in the outgoing fiscal year while significant progress was made towards achieving better health outcomes. The population growth rate slightly declined to 1.95% in the outgoing fiscal year, it added. Published in The Express Tribune, June 3rd, 2014. Shahbaz Sharif forms high-level team to raise provincial resources. CADD gets just Rs150m against proposed Rs240m for eight new schools. we listen rhetoric on the occasion of annual budget every year but the PML (N) government was far behind to attain real economic targets during fiscal year 2013-14, in almost every sector of the economy. the finance minister, must review his tall claims and rhetorics and widen the tax net rather than putting futher burden on tax paying sagment of out society to achieve financial targets. 2- imposed taxes on those imported products which affects our local industries. 3- reduce the amount of subsides with the passage of time. 4- dont start all the mega projects simultaneously, do it phase wise. 5- Question ? what you will do with circular debt again? do you have a permanent solution ?